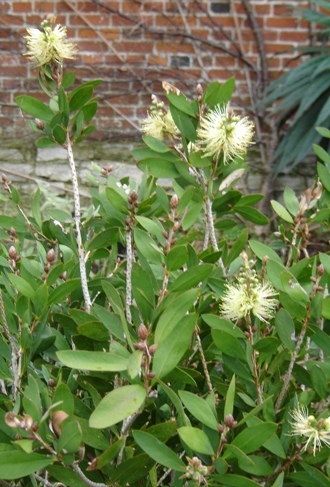 This bushy shrub originally from Australia is in early flower in an urn of traditional Georgian design in the William III bed. Lurking in the background is an Echium pininana, also called the Pride of Tenerife or Tower of Jewels, which will have a flower spike 12 ft tall. 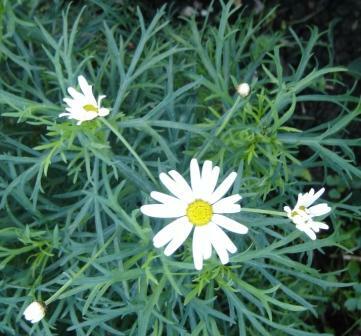 A shrubby version of this popular plant at the house end of the main lawn bed with its attractive silver grey foliage and familiar cheerful flowers reminds us of high summer. 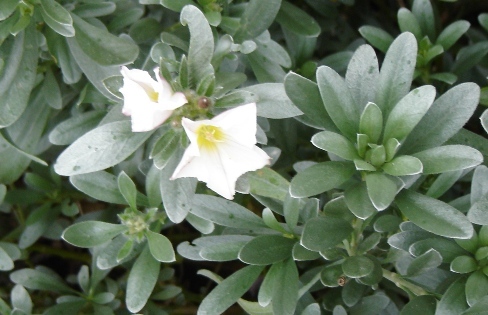 At the other end of the main lawn bed, another attractive evergreen foliage shrub with narrow lanceolate leaves covered with silky, silvery hairs and pretty pink then white flowers.